Abstract: Reference hemoglobin (Hb) values for the definition of anemia are still largely based on the 1968 WHO Scientific Group report, which established a cutoff value of <13 g/dL for adult men and <12 g/dL for adult nonpregnant women. Subsequent studies identified different normal values according to race and age. Estimated prevalence of anemia on admission in the setting of an acute coronary syndrome (ACS) is between 10% and 43% of the patients depending upon the specific population under investigation. Furthermore, up to 57% of ACS patients may develop hospital-acquired anemia (HAA). Both anemia on admission and HAA are associated with worse short- and long-term mortality, even if different mechanisms contribute to their prognostic impact. Baseline anemia can usually be traced back to preexisting disease that should be specifically investigated and corrected whenever possible. HAA is associated with clinical characteristics, medical therapy and interventional procedures, all eliciting cardiovascular adaptive response that can potentially worsen myocardial ischemia. The intrinsic fragility of anemic patients may limit aggressive medical and interventional therapy due to an increased risk of bleeding, and could independently contribute to worse outcome. However, primary angioplasty for ST elevation ACS should not be delayed because of preexisting (and often not diagnosed) anemia; delaying revascularization to allow fast-track anemia diagnosis is usually feasible and justified in non-ST-elevation ACS. Besides identification and treatment of the underlying causes of anemia, the only readily available means to reverse anemia is red blood cell transfusion. The adequate transfusion threshold is still being debated, although solid evidence suggests reserving red blood cell transfusions for patients with Hb level <8 g/dL and considering it in selected cases with Hb levels of between 8 and 10 g/dL. No evidence supports the use of iron supplements and erythropoiesis-stimulating agents in the setting of ACS. 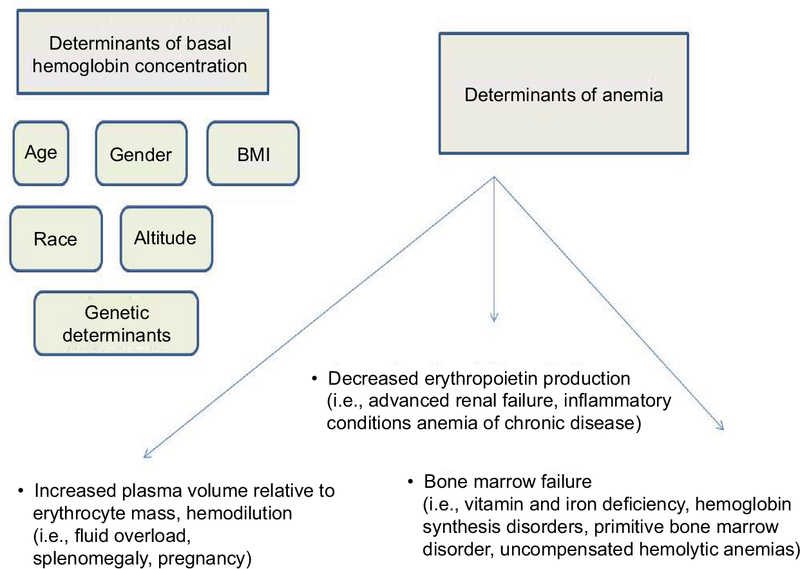 Figure 1 Determinants of anemia. All these pathogenetic determinants may be deranged in patients with ischemic heart disease, leading to abnormalities in Hb levels. Addressing the mechanism(s) underlying the development of anemia in a specific patient may help to correct anemia, and possibly overcome or lessen its negative prognostic impact in the setting of ACS (Figure 2). 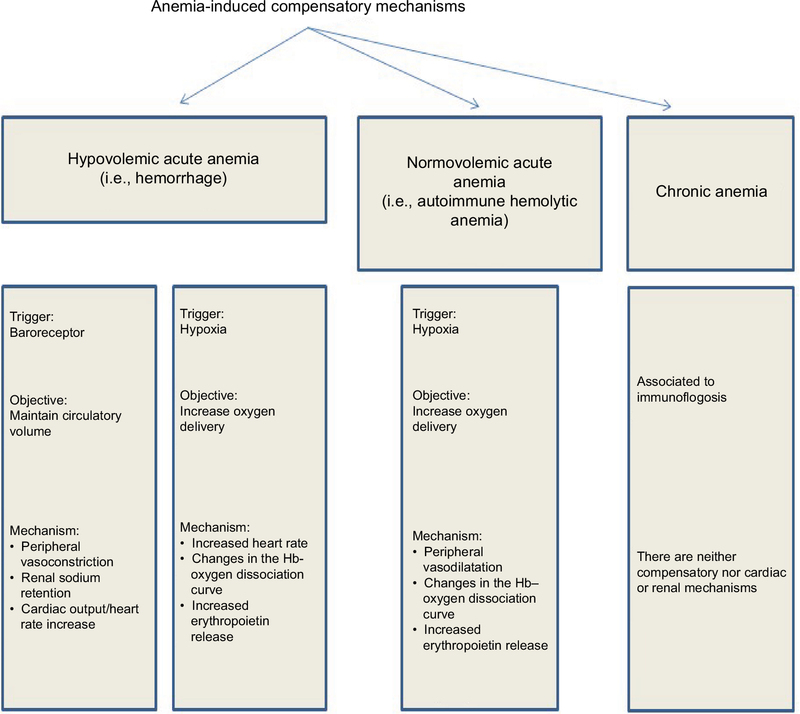 Figure 2 Anemia-induced compensatory mechanisms. The aim of this article is to present an overview of current evidence regarding epidemiology, pathophysiology, prognostic role and therapeutic management of anemia in patients with ACS. Anemia is accurately defined as an absolute decrease in RBC mass as determined by radiolabeled blood volume analysis.14 However, the definition adopted in clinical practice commonly refers to the derived parameters, Hb and hematocrit (Hct). Reference Hb values for the definition of anemia are still largely based on the 1968 WHO Scientific Group report, which established an Hb cutoff value of <13 g/dL for adult men and <12 g/dL for adult nonpregnant women.15 This definition is more a derivative of normal distribution of Hb concentrations and observed SDs from “average”, which is assumed to be the same as “normal”. More recently, several research groups tried to redefine anemia taking into account clinical variables in order to give more accurate estimates of normal values. 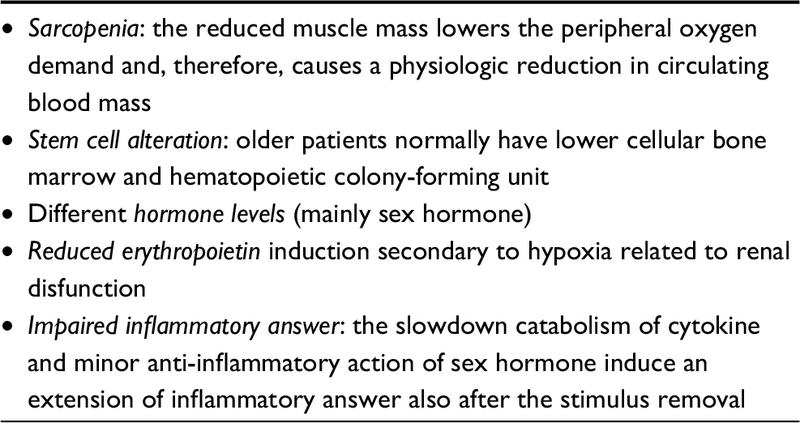 The role of age in determining Hb levels was confirmed in 2008 by Patel et al who demonstrated that the mean Hb concentration in men was lower and variance was greater with each ascending age group from 50 to >80 years.17 The reasons of this variability reside in some specific characteristics of older adults, summarized in Table 1. Several studies addressed the prevalence of anemia on admission in the setting of ACS,1–8,18 with estimates varying between 10% and 43% as summarized in Table 2. Abbreviations: ACS, acute coronary syndrome; AMI, acute myocardial infarction; N, number of in-study patients; NSTEACS, non-ST-elevation acute coronary syndrome; PCI, percutaneous coronary intervention; STEACS, ST-elevation acute coronary syndrome. Differences in prevalence can be traced back to multiple factors related to the specific population analyzed. For example, the prevalence of anemia is higher in patients from the Middle East where disorders of Hb synthesis are more frequently found.6 Nutritional deficits may also account for higher prevalence rates.6 As already mentioned, studies focusing on elderly patients usually report the highest figures. Abbreviations: ACS, acute coronary syndrome; HR, hazard ratio; N, number of in-study patients; NSTEACS, non-ST-elevation acute coronary syndrome; OR, odds ratio; RR, relative risk; STEACS, ST-elevation acute coronary syndrome. HAA, defined as development of new anemia developing during hospitalization, is often observed in patients admitted for an ACS. In the majority of patients with heart disease, anemia of chronic disease (ACD) is diagnosed. ACD is associated with a number of conditions characterized by acute or chronic immune activation,22 including heart disease, and it has also been referred to as “anemia of inflammation”.23 This specific entity should be viewed as part of the systemic inflammatory response syndrome, a first-line defensive strategy phylogenetically developed to fight microbial infections. Iron increases the virulence of most pathogens,24,25 and the release of acute-phase cytokines (tumor necrosis factor α, interleukin (IL)-1, IL-6) is associated with reduced iron availability and iron-restricted hemopoiesis,23 as shown in Table 4. In a way, anemia associated with the systemic inflammatory response syndrome can be envisioned as the price the organism has to pay to better face infection. However, if not associated with other aggravating cofactors and being part of a protective defense strategy, ACD is seldom severe and detrimental to the organism. In this perspective, the mild anemia so often found in ischemic heart disease patients may not represent a negative prognostic marker per se. Conversely, it might be viewed as a marker of a preexisting, systemic underlying disease state defining a “more fragile” patient. Aside from pathophysiological considerations, anemia may impact on the outcome because anemic patients may not receive guideline-recommended treatment for ACS. The lack of clarity in contemporary guideline recommendations as to how patients with anemia should be treated has also affected post-discharge treatment. Anemia and ACS: to treat or not to treat? Whereas the high prevalence and adverse prognostic impact of anemia in patients with ischemic heart disease are recognized, whether it deserves treatment and at which Hb cut-off level treatment needs to be implemented are still a matter of debate. This is especially true when anemia is part of the systemic inflammatory response syndrome, which is usually seldom associated with severely decreased Hb concentration. Even if anemia results from reversible conditions, for example, vitamin or iron deficiencies and immune-mediated hemolysis, days to weeks are usually necessary for its resolution. Therefore, the only readily available treatment is RBC transfusion. The debate has centered on 2 distinct transfusion strategies: one is to consider a restrictive threshold, that is, transfusion not indicated until Hb level <7–8 g/dL, and the other is to adopt a more liberal threshold, that is, transfusion not indicated until Hb level <9–10 g/dL. Most data are derived from studies including a mixed population of intensive care unit (ICU) severely ill patients, including those with cardiac disease. A limited number of studies focused on the prognostic impact of RBC transfusion in ACS patients,44–47 and results are not uniform also in this setting. Results from clinical studies were incorporated in the most recently published guidelines concerning RBC transfusion policies for critically ill patients, including those with cardiac disease. Given the absence of solid evidence based on randomized controlled trials, it is probably reasonable to adopt RBC transfusion in patients with Hb levels <8 g/dL and to avoid it in patients with Hb levels >10 g/dL. Hb levels between 8 and 10 g/dL still represent a “gray area” in which transfusion policies need to be tailored to a specific patient’s comorbidities, and may be based on the so-called physiologic transfusion triggers, which might potentially be used to replace arbitrary Hb-based transfusion triggers to estimate the limits of an individual patient’s tolerance to anemia. As in other clinical settings, for example, chronic renal failure, anemia associated with chemotherapy, the use of iron and erythropoiesis-stimulating agents (ESAs) in patients with heart disease have been considered as means to potentially reverse anemia and overcome the need for RBC transfusions. Further studies may clarify the role of ESAs in patients with preserved systolic function or in those with coronary heart disease only. Anemia is highly prevalent in the ACS setting and is associated with worse outcomes, particularly mortality. Current guidelines recommend correction of anemia <8 g/dL, except for hemodynamically unstable ACS patients who could benefit from Hb levels between 8 and 10 g/dL. RBC transfusion is the only readily available treatment, but it is not a solution without complications. However, the question remains whether anemia has a direct causative role in worsening short- and long-term morbidity and mortality, or if it is rather a marker of a poor clinical condition. In order to better understand the potential adverse impact of anemia per se, studies focused on selected groups of patients (STEACS vs. NSTEACS) and on specific Hb cut-offs, rather than on generic anemia definitions, could improve our understanding of the still unresolved issue of the impact of anemia in patients with cardiac disease. Wu WC, Rathore SS, Wang Y, Radford MJ, Krumholz HM. Blood transfusion in elderly patients with acute myocardial infarction. N Engl J Med. 2001;345:1230–1236. Archbold RA, Balami D, Al-Hajiri A, et al. Hemoglobin concentration is an independent determinant of heart failure in acute coronary syndromes: cohort analysis of 2310 patients. Am Heart J. 2006;152:1091–1095. Meneveau N, Schiele F, Seronde MF, et al; Reseau de Cardiologie de Franche Comte. Anemia for risk assessment of patients with acute coronary syndromes. Am J Cardiol. 2009;103:442–447. Tsujita K, Nikolsky E, Lansky AJ, et al. Impact of anemia on clinical outcomes of patients with ST-segment elevation myocardial infarction in relation to gender and adjunctive antithrombotic therapy (from the HORIZONS-AMI Trial). Am J Cardiol. 2010;105:1385–1394. Sulaiman K, Prashanth P, Al-Zakwani I, et al. Impact of anemia on in-hospital, one-month and one-year mortality in patients with acute coronary syndrome from the middle east. Clin Med Res. 2012;10:65–71. Kunadian V, Mehran R, Lincoff AM, et al. Effect of anemia on frequency of short- and long-term clinical events in acute coronary syndromes (from the acute catheterization and urgent intervention triage strategy trial). Am J Cardiol. 2014;114:1823–1829. Shiraishi J, Kohno Y, Nakamura T, et al; AMI-Kyoto Multi-Center Risk Study Group. Prognostic impact of chronic kidney disease and anemia at admission on in-hospital outcomes after primary percutaneous coronary intervention for acute myocardial infarction. Int Heart J. 2014;55(4):301–306. Yazji K, Abdul F, Elangovan S, et al. Baseline anemia in patients undergoing percutaneous coronary intervention after an acute coronary syndrome – a paradox of high bleeding risk, high ischemic risk, and complex coronary disease. J Interv Cardiol. 2017;30(5):491–499. Lawler PR, Filion KB, Dourian T, Atallah R, Garfinkle M, Eisenberg MJ. 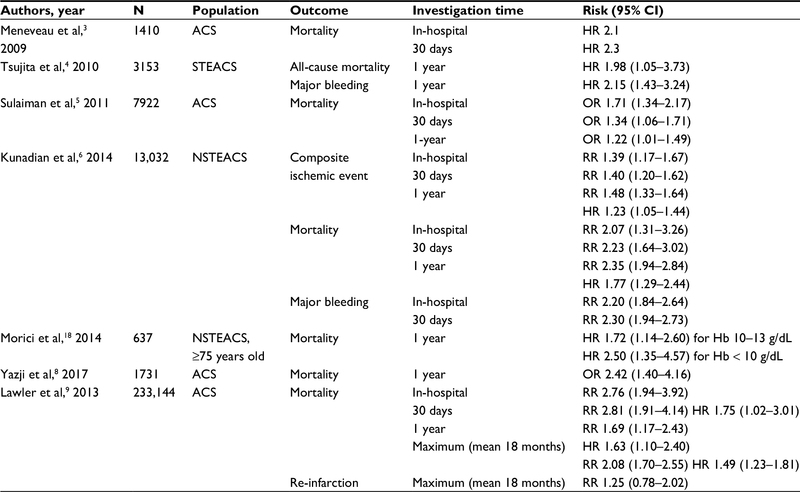 Anemia and mortality in acute coronary syndromes: a systematic review and meta-analysis. Am Heart J. 2013;165:143–153. Salisbury AC, Amin AP, Reid KJ, et al. Hospital-acquired anemia and in-hospital mortality in patients with acute myocardial infarction. Am Heart J. 2011;162:300–309. Nabais S, Gaspar A, Costa J, et al. Prognostic impact of hemoglobin drop during hospital stay in patients with acute coronary syndromes. Rev Port Cardiol. 2009;28(4):383–395. Hasin T, Sorkin A, Markiewicz W, Hammerman H, Aronson D. Prevalence and prognostic significance of transient, persistent, and new-onset anemia after acute myocardial infarction. Am J Cardiol. 2009;104:486–491. Androne AS, Katz SD, Lund L, et al. Hemodilution is common in patients with advanced heart failure. Circulation. 2003;107:226–229. Blanc B, Finch CA, Hallberg L, et al. Nutritional anaemias. Report of a WHO Scientific Group. WHO Tech Rep Ser. 1968;405:1–40. Beutler E, Waalen J. The definition of anemia: what is the lower limit of normal of the blood hemoglobin concentration? Blood. 2006;105:1747–1750. Patel KV. Variability and heritability of hemoglobin concentration: an opportunity to improve understanding of anemia in older adults. Haematologica. 2008;93:1281–1283. Morici N, Cantoni S, Antonicelli R, et al. Anemia in octogenarians with non-ST elevation acute coronary syndrome: aging or disease? Int J Cardiol. 2014;176:1147–1149. Joosten E, Pelemans W, Hiele M, et al. Prevalence and causes of anaemia in a geriatric hospitalized population. Gerontology. 1992;38:111–117. Izaks GJ, Westendorp RG, Knook DL. The definition of anemia in older persons. JAMA. 1999;281:1714–1717. Mancini DM, Katz SD, Lang CC, et al. Effect of erythropoietin on exercise capacity in patients with moderate to severe chronic heart failure Circulation. 2003;107(2):294–299. Cash JM, Sears DA. Anemia of chronic disease: spectrum of associated diseases in a series of unselected hospitalized patients. Am J Med. 1989;87:638–644. Weiss G, Goodnough LT. Anemia of chronic disease. N Engl J Med. 2005;352(10):1011–1023. Bullen JJ, Rogers HJ, Spalding PB, Ward CG. Iron and infection: the heart of the matter. FEMS Immunol Med Microbiol. 2005;43(3):325–330. Marx JJ. Iron and infection: competition between host and microbes for a precious element. Best Pract Res Clin Haematol. 2002;15(2):411–426. Solomon A, Blum A, Peleg A, Lev EI, Leshem-Lev D, Hasin Y. Endothelial progenitor cells are suppressed in anemic patients with acute coronary syndrome. Am J Med. 2012;125:604. Shander A, Javidroozi M. The patient with anemia. Current Opinion Anesthesiology. 2016;29(3):438–445. Sudarsky D, Sudarsky M, Matezky S, et al. Impact of early invasive approach on outcomes of patients with acute coronary syndrome and baseline anemia: analysis from the ACSIS registry. J Interven Cardiol. 2015;28:315–325. Lee SH, Jeong MH, Han KR, et al. Comparison of transradial and transfemoral approaches for percutaneous coronary intervention in patients with acute coronary syndrome and anemia. Am J Cardiol. 2016;117:1582–1587. Farhan S, Baber U, Mehran R. Anemia and acute coronary syndrome: time for intervention studies. J Am Heart Assoc. 2016;5:e004908. Pawloski JR, Stamler JS. Nitric oxide in RBCs. Transfusion. 2002;42:1603–1609. Zimmerman R, Tsai AG, Salazar Vázquez BY, et al. Posttransfusion increase of Hematocrit per se does not improve circulatory oxygen delivery due to increased blood viscosity. Anesth Analg. 2017;124:1547–1554. Hendrickson JE, Hillyer CD. Noninfectious serious hazards of transfusion. Anesth Analg. 2009;108(3):759–769. Tsai AG, Cabrales P, Intaglietta M. Microvascular perfusion upon exchange transfusion with stored red blood cells in normovolemic anemic conditions. Transfusion. 2004;44:1626–1634. Du Pont-Thibodeau G, Harrington K, Lacroix J. Anemia and red blood cell transfusion in critically ill cardiac patients. Ann Intensive Care. 2014;4:16. Carson JL, Sieber F, Cook DR, et al. Liberal versus restrictive blood transfusion strategy: 3-year survival and cause of death results from the FOCUS randomised controlled trial. Lancet. 2015;385(9974):1183–1189. Hebert PC, Wells G, Blajchman MA, et al. A multicentre, randomized, controlled clinical trial of transfusion requirements in critical care. N Engl J Med. 1999;340:409–417. Deans KL, Minneci PC, Suffredini AF, et al. Randomization in clinical trials of titrated therapies: unintended consequences of using fixed treatment protocols. Crit Care Med. 2007;35:1509–1516. Carson JL, Guyatt G, Heddle NM, et al. Clinical practice guidelines from the AABB red blood cell transfusion thresholds and storage. JAMA. 2016;316(19):2025–2035. Vincent JL, Sakr Y, Sprung C, et al. Are blood transfusions associated with greater mortality rates? Results of the sepsis occurrence in acutely ill patients study. Anesthesiology. 2008;108:31–39. Vincent JL, Lelubre C. The sicker the patient, the more likely that transfusion will be beneficial. J Thorac Dis. 2017:9:4912–4914. Mazer CD, Whitlock RP, Fergusson DA, et al; TRICS Investigators and Perioperative Anesthesia Clinical Trials Group. Restrictive or liberal red-cell transfusion for cardiac surgery. N Engl J Med. 2017;377:2133–2144. Docherty AB, O’Donnell R, Brunskill S, et al. Effect of restrictive versus liberal transfusion strategies on outcomes in patients with cardiovascular disease in a non-cardiac surgery setting: systematic review and meta-analysis. BMJ. 2016;352:i1351. Chatterjee S, Wetterslev J, Sharma A, et al. Association of blood transfusion with increased mortality in myocardial infarction: a meta-analysis and diversity-adjusted study sequential analysis. JAMA Intern Med. 2013;173(2):132–139. Rao SV, Jollis JG, Harrington RA, et al. Relationship of blood transfusion and clinical outcomes in patients with acute coronary syndromes. JAMA. 2004;292:1555–1562. Alexander KP, Chen AY, Wang TY, et al. Transfusion practice and outcomes in non–ST-segment elevation acute coronary syndromes. Am Heart J. 2008;155:1047. Kansagara D, Dyer E, Englander H, et al. Treatment of anemia in patients with heart disease. A systematic review. Ann Intern Med. 2013;159:746–757. National Institute for Health and Clinical Excellence. Transfusion: NICE guideline NG24. 2015. Available from: http://www.nice.org.uk/guidance/ng24/evidence/full-guidance-2177160733. Carson JL, Carless PA, Hebert PC. Transfusion thresholds and other strategies for guiding allogeneic red blood cell transfusion. Cochrane Database Syst Rev. 2012;4:CD002042. Anker SD, Comin Colet J, Filippatos G, et al; FAIR-HF Trial Investigators. Ferric carboxymaltose in patients with heart failure and iron deficiency. N Engl J Med. 2009;361:2436–2448. Comin-Colet J, Lainscak M, Dickstein K, et al. The effect of intravenous ferric carboxymaltose on health related quality of life in patients with chronic heart failure and iron deficiency: a subanalysis of the FAIR-HF study. Eur Heart J. 2013;34:30–38. Koskenkorva-Frank TS, Weiss G, Koppenol WH, Burckhardt S. The complex interplay of iron metabolism, reactive oxygen species, and reactive nitrogen species: insights into the potential of various iron therapies to induce oxidative and nitrosative stress. Free Radic Biol Med. 2013;65:1174–1194. Litton E, Xiao J, Ho KM. Safety and efficacy of intravenous iron therapy in reducing requirement for allogeneic blood transfusion: systematic review and meta-analysis of randomised clinical trials. BMJ. 2013;347:f4822. Ruifrok WPT, Lipsic E, de Boer RA, et al. Erythropoiesis stimulation in acute ischemic syndromes. Heart Failure Clin. 2010;6:313–321.